PHILADELPHIA – As the New York Mets jogged off the field at the conclusion of the first inning Tuesday, joining their starting pitcher who already departed earlier, the city of brotherly love gave them a standing ovation. What was not to like for the Phillies’ fans? Starter Steven Matz became the fifth pitcher in MLB history to face at least eight batters and not record an out. He, too, received a rousing ovation when he exited the field six batters earlier. Shortstop Amed Rosario, an ascending, young talent, booted two balls right at him. 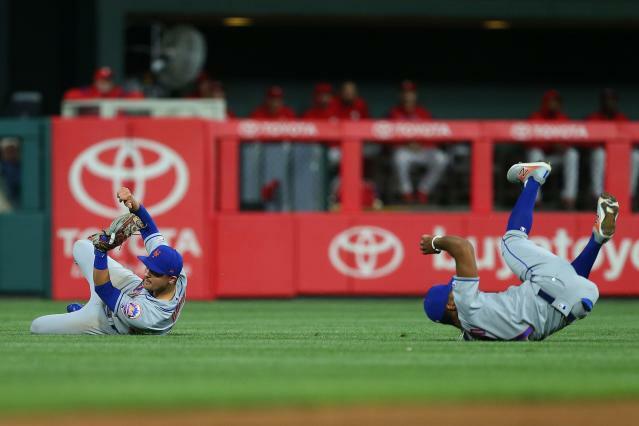 Infielder Jeff McNeil, manning left field, had a ball careen off his glove to plate the final two runs of a 10-run barrage, the most scored against the Mets in the first inning in 30 years. Most teams are roughly 10% of the way through their schedule, and the bar has already been set for the worst inning by any team this year. The Mets are playing a strong brand of baseball to start the season, yet that first inning in a 14-3 loss was a page out yesteryears, a truly #LOLMets moment. They couldn’t make routine plays, their pitchers served up meatballs, and Brandon Nimmo even exited due to a stiff neck. Matz entered this game with a sparkling 1.65 ERA, and after just 31 pitches Tuesday, he now has a spot in the record books. The southpaw actually induced an easy grounder to Rosario to begin his outing, but the shortstop botched the play, setting the tone for the night. The rest of Matz's night went as follows: hit by pitch, two-run double, three-run homer, walk, error by Rosario, three-run homer, trip to the dugout. Eight men came to the plate to battle Matz, and all eight scored. Matz is the first Mets pitcher to fail to record an out in a start since Jeremy Hefner on Sept. 20, 2012, and it’s the sixth time in MLB history a pitcher has not retired any of the eight batters he faced. He joined a group featuring Paul Wilson (twice), Blake Stein, Bobby Jones and Bill Krueger. The two errors by Rosario were his first two of the young season, and McNeil also made a throwing error after he failed to catch a hard liner by J.T. Realmuto that plated two runs and put the Phillies ahead, 10-0. Realmuto, whom the Mets tried to acquire this offseason before pivoting to Wilson Ramos, had four RBIs in that first inning, and finished with five. The Mets were originally charged with four errors in the inning before the official scorer gave Realmuto a two-run double instead of charging McNeil with an error on the ball that went off his glove. The four errors would have matched a single-inning franchise record, so the Mets were at least saved from matching that ignominious record. Once Matz departed, Drew Gagnon, who threw 87 pitches on Friday for Triple-A Syracuse, took one for the team, as the saying goes. Gagnon threw 97 pitches on three days rest, and while he allowed six runs, he and Paul Sewald saved the team’s bullpen by finishing the game. For Gagnon’s efforts, he earned praised from his manager and a trip back to Syracuse in the near future. Unlike Matz and the position players, the Citizens Bank Park crowd at least spared Gagnon from a standing ovation. After all, they had already shown enough love for their rivals in that first inning.